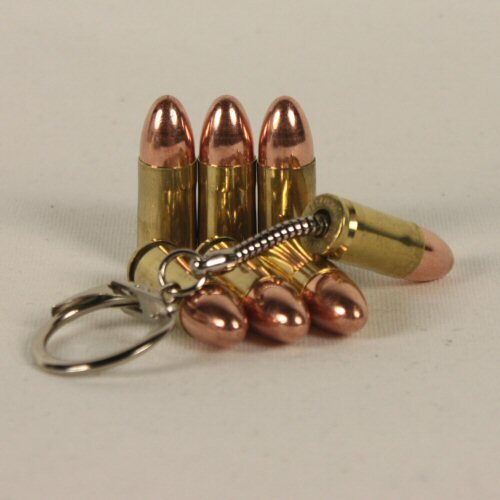 The 9mm bullet keychain is made from a single fired case in 9mm Luger also known as 9x19mm Parabellum which has been refitted with a 124 grain FMJ head. The keychain is inserted into the primer pocket and held securely in the case. Heads are correctly fitted with a press and not hammered in place, so the round has a more authentic appearance over rounds where the heads have been inserted too deeply. Case necks have been crimped to hold the bullet head in place. Perfect for film, display, diorama or to add authenticity to a firearm. Can also be worn as fashion accessory. Cases are brass. Please note that all rounds have no propellant or live primers. This is a deactivated 9mm Luger bullet. To restore a shiny finish, rub the cartridge with toothpaste or a commercial cleaner. Please note that price is for ONE round only. NB: All inert ammunition travelling OUTSIDE mainland UK by Royal Mail is subject to additional delivery delays if it is re-routed to surface shipping as a result of its appearance through an X-Ray machine. We will always endeavour to ship this type of item via international courier (eg TNT, DHL).